and political commentary on American society. 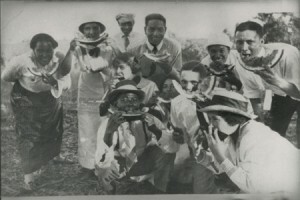 In “American Cuisine”, images of food associated with African Americans, Asians and Native American, such as Oreos,Brazil nuts, watermelon, sweet potatoes, apples, chopsticks, and bananas, become visual stand-ins for the racial and class prejudices deeply embedded inside American culture. This exhibition was made possible with the generous support of the San Francisco Art Commission/Cultural Equity Grant Program, The Andy Warhol Foundaiton for the Arts, The Phyllis C. Wattis Foundaiton and Grants for the Arts of the Hotel Tax Fund. Based on his premise that people of color will be the dinner served atAmerica’s Last Supper, conceptual artist Ramekon O’Arwisters (SuperArtHero) creates a series of original visual art and sculpture in whichrepresentations of ordinary food items serve as coded carriers of social and political commentary on American society. In “American Cuisine”,images of food associated with African Americans, Asians and Native American, suchas Oreos,Brazil nuts, watermelon, sweet potatoes, apples, chopsticks, andbananas, become visual stand-ins for the racial and class prejudices deeplyembedded inside American culture.